This is the INFERIOR COLLICULUS of the rat immunostained for VGLUT2 (green) axonal terminals. GABAergic neurons are immunostained with GAD67 (red). Neuronal cell bodies and non-neuronal cells are Nissl-stained with Neurotrace (blue). The images were taken on a Zeiss laser-scanning confocal microscope at a single Z-plane with a 40x/1.3NA lens and assembled in Photoshop. This is the TRANSGENIC GAD67/GFP mouse. GABAergic neurons are green with GFP. 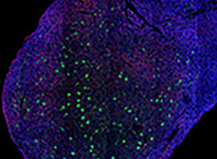 VGLUT2 is immunostained red. Neuronal cell bodies are immunostained for MAP2 that is only seen in neurons (blue). 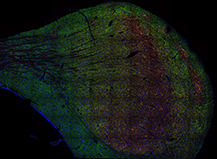 The images were taken on a Zeiss laser-scanning confocal microscope at a single Z-plane with a 40x/1.3NA lens and assembled in Photoshop. Distribution of VGLUT1-, VGLUT2-, and VIAAT-expressing neurons in the rodent auditory brainstem. Inhibitory tectothalamic neurons receive a specialized glutamatergic synapse.